The most basic of childhood science experiments is the mixing of baking soda and vinegar- who didn’t make a tiny volcano in their kitchen as a kid? For this experiment I decided to step it up a notch by making baking soda ice “bombs” that Carter could drop into the vinegar to see what would happen! All you need a vinegar, baking soda, water and an ice tray! Add water a little bit at a time to the baking soda and mix to make a smooth paste. Add food coloring if you want a little color! Divide the mixture into your ice tray and freeze overnight. I would recommend doing this outside, just in case! Pour enough vinegar into a large container to cover the bottom. 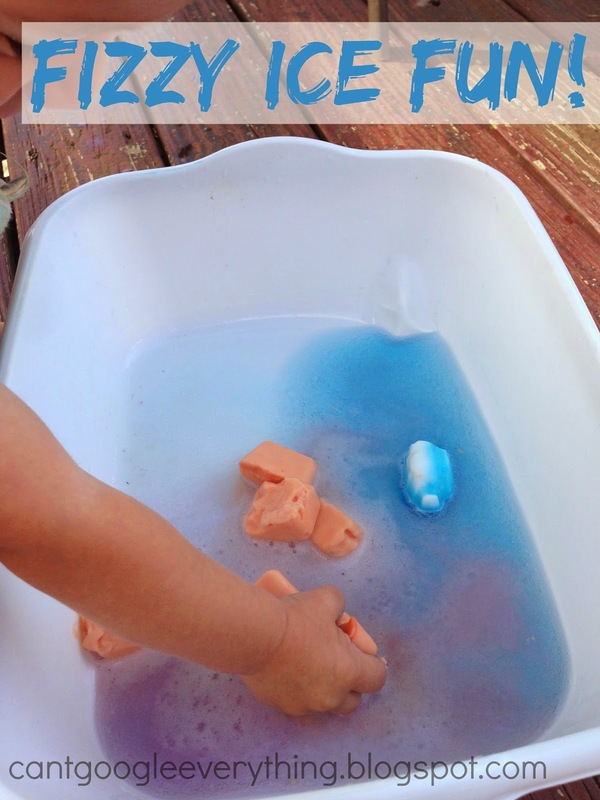 Throw in the baking soda ice (or let your kid do it) and they will make mini explosions! For whatever reason, the blue one separated a little into layers when it froze so that one reacted a little differently to the vinegar than the orange ones did! You will have to move the ice cubes around a little to keep the fizzy reaction going. Carter experimented a little with the ice cubes and splashing the vinegar on them and mixing it all around with his hands! We even added a little extra vinegar with a spray bottle to see what would happen. We played until the bombs were almost completely dissolved and all mixed in. Carter really used all his senses for this experiment! He quickly realized that “taste” was not the best sense to use with baking soda! Have you tried baking soda and vinegar experiments with your kids? What did you do similar or different? What a fun little experiment for Carter! I bet that "taste" sense was not so good haha! This is SO cool!! My son just did a whole load of science stuff at vacation bible school. I wonder if they did this. I'll have to ask him! I pinned this because I KNOW we'll be doing this SOON! TY!